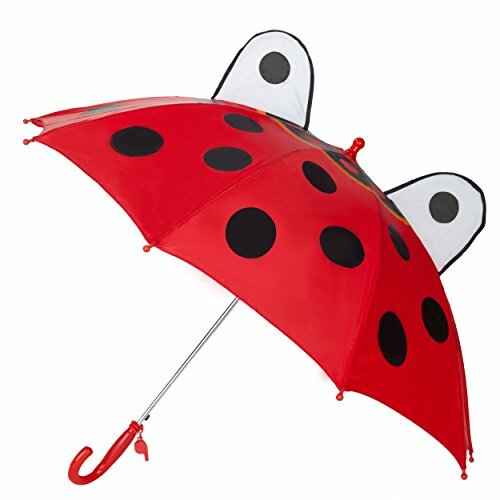 Kid's Fun Adorable Red Ladybug Animal Easy-Open UV Protection Whistle Umbrella by Roxie at Fdccla. Hurry! Limited time offer. Offer valid only while supplies last. Rainy day at school? Don't let your kids get soaked by the rain and catch a cold. Give your kids this adorable animal umbrella to avoid the rain! Rainy day at school? Don't let your kids get soaked by the rain and catch a cold. Give your kids this adorable animal umbrella to avoid the rain! Your kids will love the fun design and their friends will admire them for how cute their umbrella is. Simple button to open makes this umbrella easy for any children to use. Comes with a fun whistle. Comes in Red Ladybug style. Adorable Animal Design：Fun and unique designed with kid's favorite animals and insects (Bear, Butterfly, Ladybug, Bee, Panda). Boys and girls love these child-sized animal umbrellas in any weather. Comes with a fun whistle. Premium Quality: Made of high quality, anti-UV and child-safe nylon material with 10-rib metal safety frame, this durable and lightweight umbrella is strong enough to withstand rain, sunshine, wind or snow. Keep your little ones safe and clean in any weather. Easy Open and Close: Lovely pop up design automatic kid umbrella is easy to open with just a press of a button. The kid's kidorable umbrella comes with a VELCRO strap for quick storage. Child-Sized Umbrella: Open Diameter: 30 inches. Height: 23 inches. One size is large enough for big kids and light enough for little kids and toddlers to use. Fun and Practical: With these lovely animal umbrellas, your kids will be braver to face rainy day adventures. Perfect for back to school, birthday, Christmas gift for your kids, your kids will love this! If you have any questions about this product by Roxie, contact us by completing and submitting the form below. If you are looking for a specif part number, please include it with your message.